Professor Andrew Oswald and Lord Gus O'Donnell, internationally known experts in this field, will describe how the Office of National Statistics now measures the genuine happiness and well-being of the United Kingdom. They will divulge what the latest numbers show, and why we should use this kind of information to replace old-fashioned ideas that traditionally focussed simply on GDP and economic growth. There will be a large amount of time left for questions and debate from the audience to keep everyone happy! Andrew Oswald is Professor of Economics at the University of Warwick. He joined the university in 1996 from the London School of Economics, and taught previously at Oxford and in a number of US Ivy League universities. His research is on economics, statistics, and quantitative social science. It includes work on the determinants of human happiness and psychological well-being, the influence of home ownership upon the western nations' labour market, the role of randomized trials in the design of social and economic policy, and the behavioural influence of human diet. He serves on the board of editors of Science, is an ISI Highly Cited Researcher, was a member of the Stiglitz Commission into the measurement of social progress and human well-being, and serves on the main panel of the Leverhulme Trust. Andrew Oswald's recent publications include articles on the life-cycle happiness of chimpanzees and orang-utans (in the Proceedings of the National Academy of Sciences of the USA in 2012), the influence of happiness upon human productivity in randomized controlled trials (in the Journal of Labor Economics in 2015), the role of wisdom in ageing (in Psychiatry: Interpersonal and Biological Processes in 2014), and longitudinal evidence for the existence of a midlife nadir in humans (in the Economic Journal in 2015). 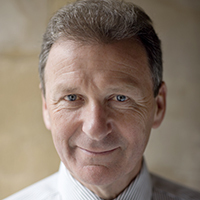 Lord Gus O’Donnell is a former British senior civil servant and economist who, between 2005 and 2011 (under three Prime Ministers), served as the Cabinet Secretary, the highest official in the British Civil Service.